And when the meeting broke up, like clock work at precisely five o'clock, Gambari declines to speak with the Press, saying to wait for Ban to return to New York. 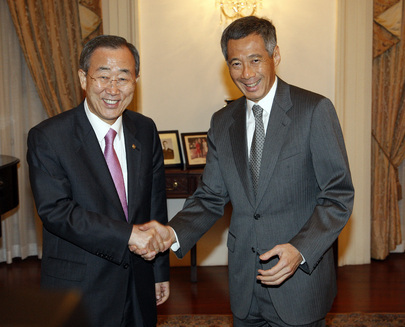 Inner City Press said, or asked, "Ban will speak to the Security Council?" "Or to this group," Gambari answered. That would be to further downgrade the Myanmar issue. 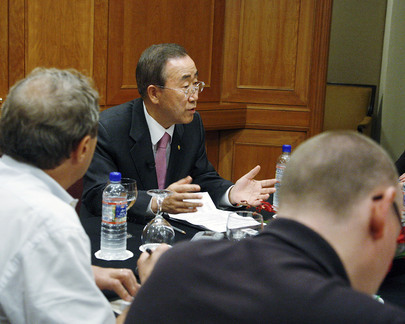 UNITED NATIONS, July 8 -- In the run up to the trip to Myanmar by UN Secretary General Ban Ki-moon and his envoy Ibrahim Gambari, Prime Minister Gordon Brown told the House of Commons that the UK had urged Ban to go to Burma. The trip took place; General Than Shwe rejected Ban's request to meet with opposition leader Aung San Suu Kyi; nearly everyone called the endeavor a failure. 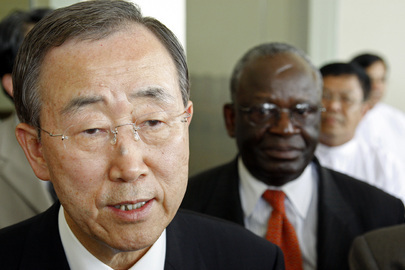 With Ban still out of New York, at the G-8 meetings in Italy, Gambari descended to the UN basement on July 8 to brief the 14 countries on Ban's Group of Friends on Myanmar. 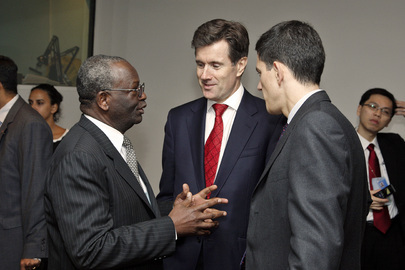 Notably, UK Permanent Representative John Sawers was not present, unlike his counterparts from Japan, Indonesia and Singapore, among others. Some some suspected Facebook fallout -- and joked of Sawers not "friending" the Group -- others questioned the UK being so loud before the trip, and so quiet afterwards, at least in public. Gambari, normally affable, rushed into the meeting room. UN staff have confirmed to Inner City Press that Than Shwe in a fit of pique made Gambari travel to the country's jungle capital by road, rather than by air. Reportedly, surrounded by the Ban-selected scribes on this most recent trip, Gambari wished for the presence of other reporters, to witness the indignities and discomforts that he has been going through. Indonesia's Ambassador strode in jaunty as ever; Japan's Takasu with a staffer. China's also jaunty Deputy had Xinjiang on his mind, saying that despite Turkish Prime Minister Erdogan's statement that Turkey will put Xinjiang on the Security Council's agenda (see Inner City Press story here), the Turkish Mission to the UN has received no instructions to this effect. 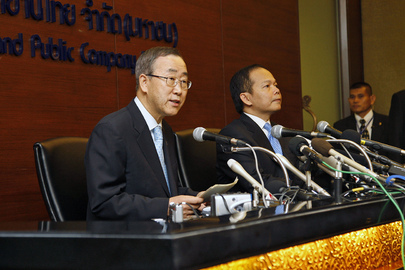 Other Ambassador's marveled at the recent and dirty campaign to re-nominate Mr. Supachai as secretary general of UNCTAD. Diplomat's minds seemed everywhere except on Myanmar. But since the UK asked for the trip, some felt Sawers should have been present. He spoke of the issue earlier in the day, but only to select reporters, and only off the record. Whether this approach is the best for Burma is in question. Watch this space. Update of 4:07 p.m. -- to be fair, Sawers' affable deputy was present. Whether he will speak on the record after the meeting, given the UK's role, remains to be seen. Update of 4:31 p.m. -- while the Friends on Myanmar continue meeting, the head of a Security Council mission spoke to Inner City Press about the Turkish Prime Minister - China imbloglio: "that's why we have a free Press," he said.... But on Myanmar, there are no other reporters outside the Friends' basement meeting. Update of 5:15 p.m. -- And when the meeting broke up, like clock work at precisely five o'clock, Gambari declines to speak with the Press, saying to wait for Ban to return to New York. Inner City Press said, or asked, "Ban will speak to the Security Council?" "Or to this group," Gambari answered. That would be to further downgrade the Myanmar issue. At UN, July 8 Briefing on Ban's Burmese Failure by Gambari, Japan Says "Too Early"
UNITED NATIONS, July 7, updated -- While by nearly any measure UN Secretary General Ban Ki-moon's two day visit to Myanmar was a diplomatic failure, on July 6 when Inner City Press asked Japan's Ambassador to the UN Yukio Takasu to assess the trip, he said it was "too early" for that, that when Ban returns from Europe they will get a full briefing and address the issue. Video here, from Minute 6:43. But the so-called Group of Friends on Myanmar, Inner City Press has learned, will be briefed on July 8 by Ban's envoy to Myanmar, Ibrahim Gambari. Some view this as distancing Ban from the lack of accomplishments on the trip, which they view as having provided some legitimacy to the regime of General Than Shwe. Gambari, recently offered up to replace Rodolphe Adada for the UN in Darfur, has been to Myanmar eight times and has little to show for it. Gambari's supporters blame the "Western powers" for not giving him any carrots with which to tempt the generals. But perhaps the Myanmar regime, like Sri Lanka's, doesn't need the West's carrots. China and India are competing for Myanmar's natural gas -- along with French and other Western companies. North Korea is helping militarily, at least with advice on building underground weapons plants. 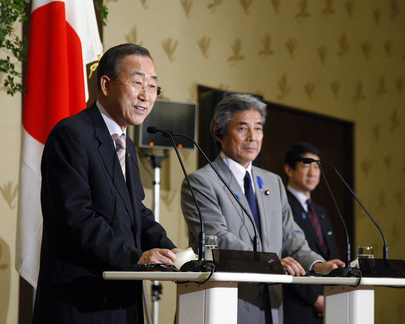 Japan's position remains ambiguous. While following the Burmese military's murder of a Japanese cameraman during the abortive Saffron Revolution Japan spoke out about Myanmar, Japan was notably less concerned with the human rights of civilians during this year's assault on Northern Sri Lanka by the Mahinda Rajapaksa regime. Amb. Takasu says he's waiting to hear from Ban, but Japan will be represented at the July 8 briefing by Ban's envoy Gambari. Watch this site. Post-script: it's been reported that the "former armed groups" with which Ban met were told by the Than Shwe regime what to say. This will be inquired into. Update of 12:23 p.m. -- Inner City Press asked Ban's Spokesperson Michele Montas about this at Tuesday's UN noon briefing. Ms. Montas said that Ban had thought the groups were free to speak, that he is not yet aware of reports to the contrary but he will be. For convenience sake, check this, and watch this site. UNITED NATIONS, July 4 -- Immediately following Burmese dictator Than Shwe's rebuff of UN Secretary General Ban Ki-moon even visiting opposition leader Aung San Suu Kyi, Ban told the reporters he hand picked to accompany him that Than Shwe had in fact shown that he is willing to "hand over all power." Ban is quoted that Than Shwe "was saying that after (an election) he will hand over power to civilians. He said when I come back he may be a civilian...That means he's committed to hand over all power." First, there is no indication that Than Shwe and his cronies have any intention of handing over power. Second, even the quote, which was run without any critique or analysis, can be read that power may go a a civilian, Than Shwe is ready to present himself as a civilian and keep power. Inner City Press: During these two days that he is there, if we’re trying to cover it from here, have questions, who do we seek to get some answers? Spokesperson Montas: It’s going to be extremely difficult. The materials that your colleagues are sending will give you information, but there is no way you can reach, it’s going to be very difficult to reach people in Myanmar when they are there because of communications problems. But now it's clear that the Team was allowed to use the Internet while there: "We also had access to the Internet to file stories and send emails about Ban's second trip to the new capital." 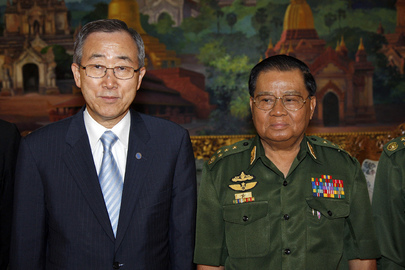 UN's Ban and Than Shwe: who's ready to hand over all power? So why wasn't the promised pool coverage provided? Increasingly it appears that Team Ban, faced with negative reviews, tries to control coverage. The UN News Service dutifully pushed out a story which didn't even mention any of the criticism of Ban and his Myanmar trip. In the run up to negative profiles in two major U.S. dailies, as Inner City Press first reported, Team Ban brought in the Los Angeles Times for a Q&A with strangely staged questions about the "Asian style" of diplomacy. 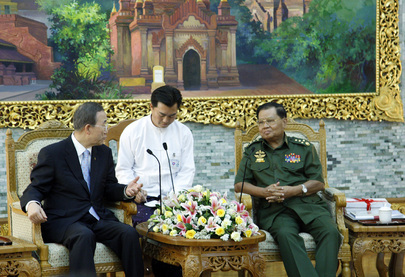 But as one scribe put it, "Ban has faced recent criticism for his softly-softly approach to the job of secretary general, but diplomats say he had hoped his quiet brand of diplomacy would work with Myanmar's generals." And it failed, even by Team Ban's own pre-trip measure. Watch this site. Inner City Press asked Ms. Montas to confirm the information in a list it has seen, that there are at least 22 UN personnel in Ban's traveling party, ranging from political chief Lynn Pascoe and deputy chief of staff Kim Won-soo to Hak-Fan Lau, to whom reporters on Ban's previous UN mission to Burma gave at least some pooled material. "I can check for you," Ms. Montas answered. By 4 p.m. on July 4 in New York, no information was provided. Watch this site. UNITED NATIONS, July 4 -- As UN Secretary General Ban Ki-moon leaves Myanmar, not only is Aung San Suu Kyi still on trial, Mr. Ban was not allowed to visit her. On the other hand, Ban offered ham handed praise of Than Shwe's moving his country forward. Ban claimed that perhaps other political prisoners would be released, if not now then before the election. 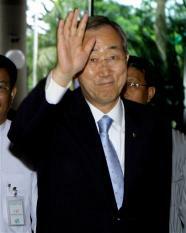 Why did Ban Ki-moon go to Myanmar? In the run-up to the trip, before it was announced that he would go, Ban sent his envoy Ibrahim Gambari to test the waters. Whatever test was applied, upon Gambari's return to New York, Ban's office confirmed to the eight journalists hand picked to be allowed to cover Ban's trip that it would in fact occur. Several had been told in advance and had booked tickets, canceled them then re booked at additional cost. With Ban already in Japan with an entourage of 22 UN personnel -- but few of the selected UN correspondents cover this first leg of the trip -- Inner City Press asked Ban's spokesperson Michele Montas what would be in the indicia of if Ban's Myanmar venture was a success or a failure. The question was asked against the background of negative reviews of Ban's performance and predictions that Myanmar's Than Shwe regime would use Ban's trip to legitimize their trial of opposition leader Aung San Suu Kyi and their highly controlled, pro-military mock election planned for 2010. Ms. Montas reacted with exasperation, saying that Ban had clearly enunciated his goals for the trip. But that was not the question: how would the public know if it was a success or failure? Montas appeared to acknowledge that if the goals Team Ban had set out were not moved forward during the trip, it would be a failure. Now, not only is Aung San Suu Kyi still on trial, Ban was not allowed to visit her. On the other hand, Ban offered ham handed praise of Than Shwe's moving his country forward. Ban claimed to his hand-picked scribes that perhaps other political prisoners would be released, if not now then before the election. Meanwhile North Korea, fresh from throwing Korean-speaking international UN staff out of the country, fired seven missiles in contempt for the US, the UN and, some said, Mr. Ban Ki-moon. The UN Spokesperson never provided basic information that had been promised in the pre-holiday press briefings. None of the promised pool reports were ever provided. And the circus like trip continued. Watch this site.